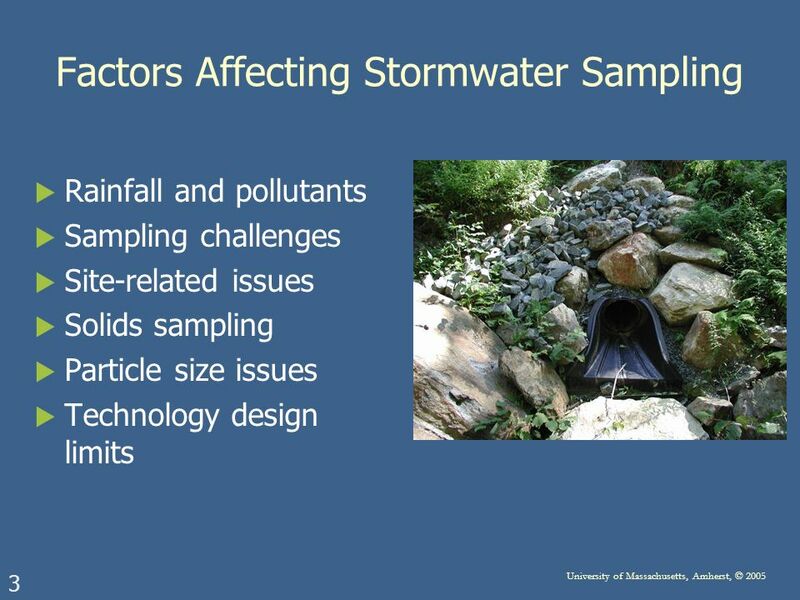 1 University of Massachusetts, Amherst, © 2005 Storm Water Best Management Practices Evaluation, Testing and Technology Transfer New England Stormwater. 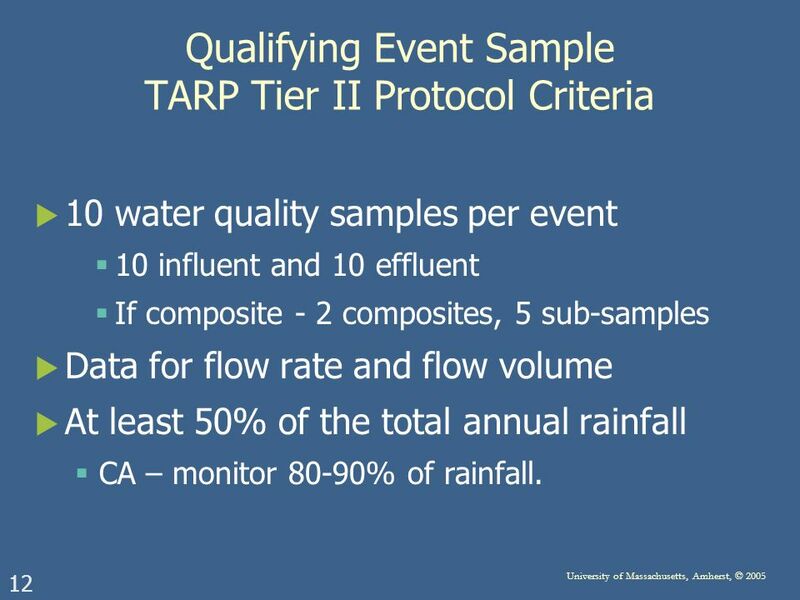 12 12 University of Massachusetts, Amherst, © 2005 Qualifying Event Sample TARP Tier II Protocol Criteria 10 water quality samples per event 10 influent and 10 effluent If composite - 2 composites, 5 sub-samples Data for flow rate and flow volume At least 50% of the total annual rainfall CA – monitor 80-90% of rainfall. 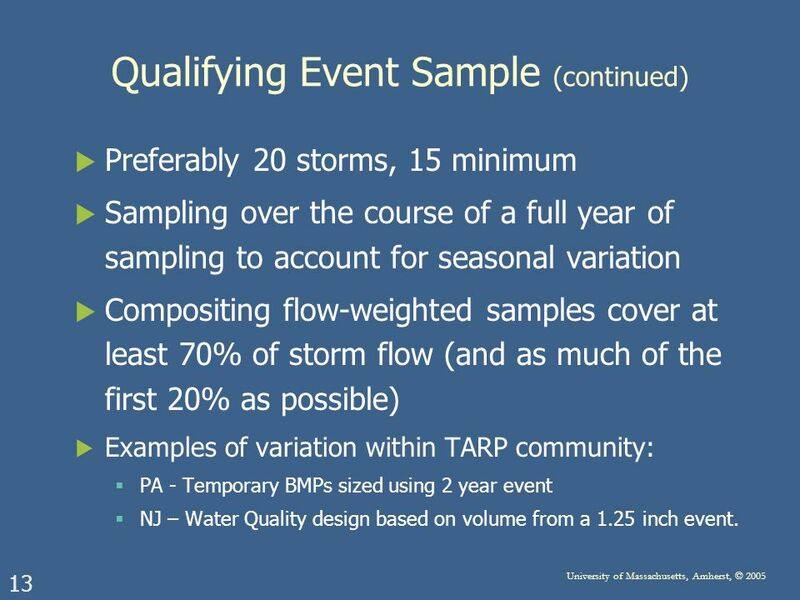 13 13 University of Massachusetts, Amherst, © 2005 Qualifying Event Sample (continued) Preferably 20 storms, 15 minimum Sampling over the course of a full year of sampling to account for seasonal variation Compositing flow-weighted samples cover at least 70% of storm flow (and as much of the first 20% as possible) Examples of variation within TARP community: PA - Temporary BMPs sized using 2 year event NJ – Water Quality design based on volume from a 1.25 inch event. 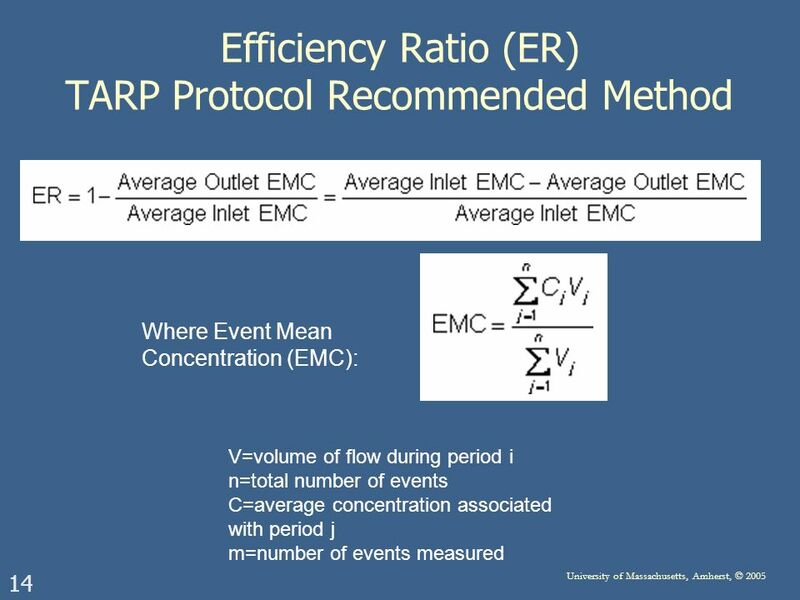 15 15 University of Massachusetts, Amherst, © 2005 Efficiency Ratio Interpretation EMCs weight all storms equally. 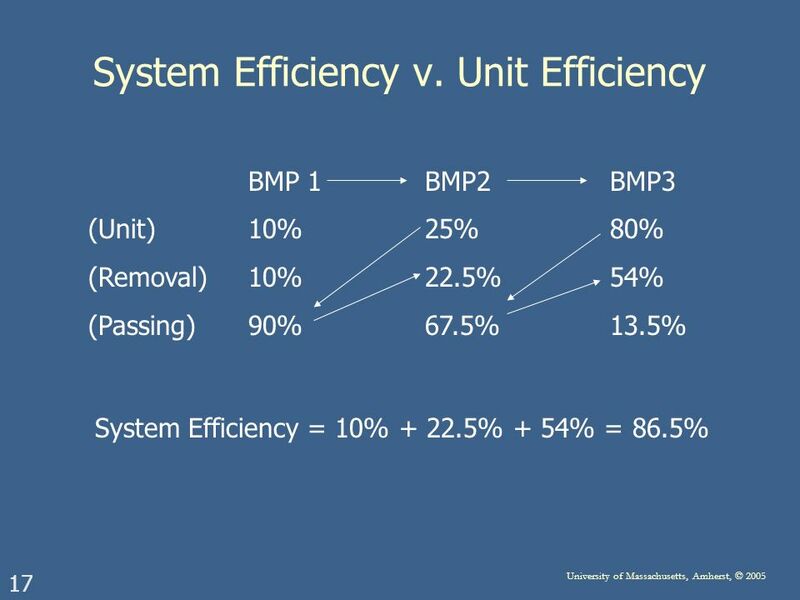 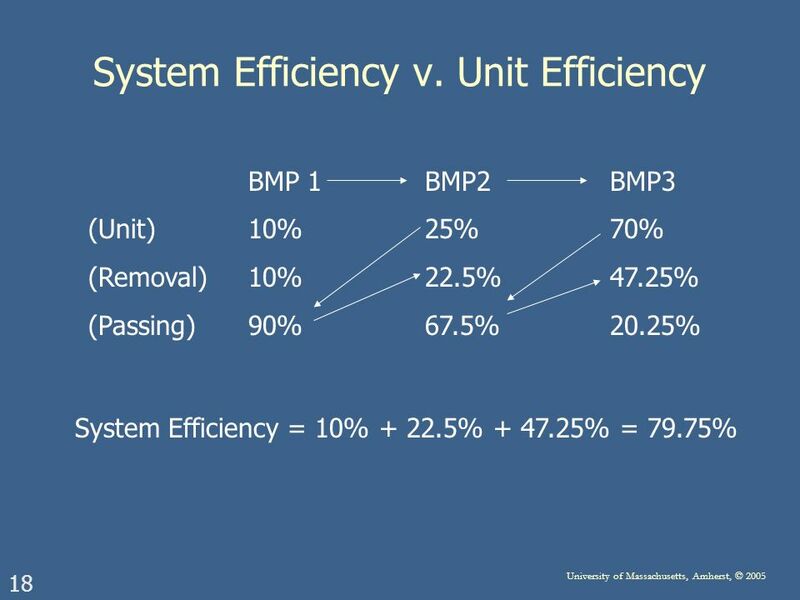 Most useful when loads are directly proportional to the relative magnitude of the storm – accuracy varies with BMP type. 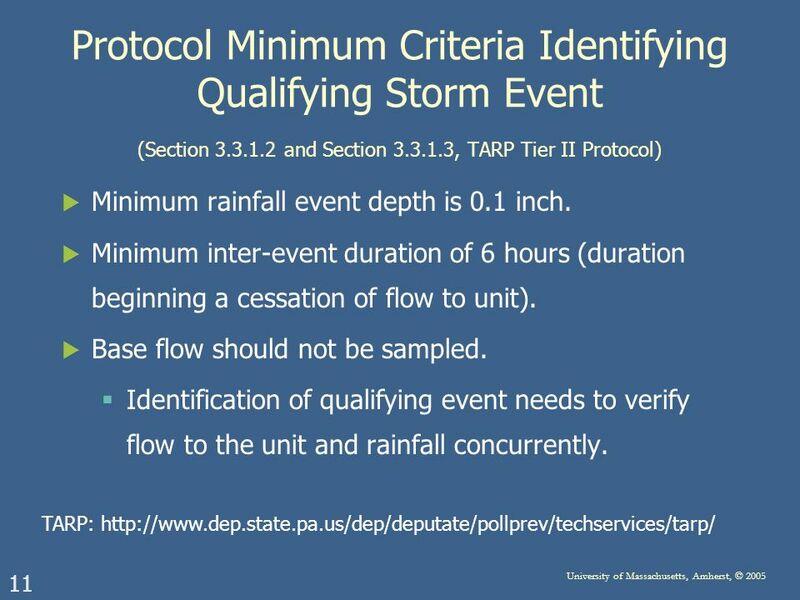 Minimizes impacts of smaller/cleaner storms. 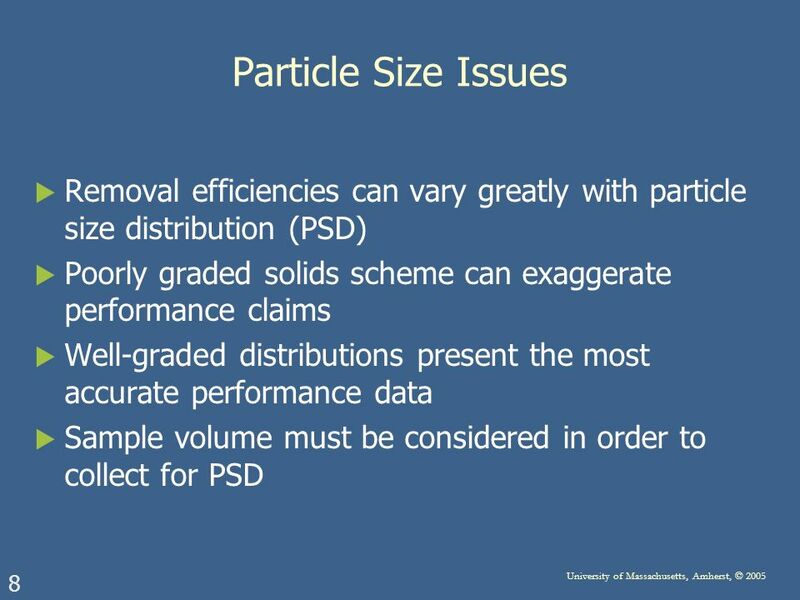 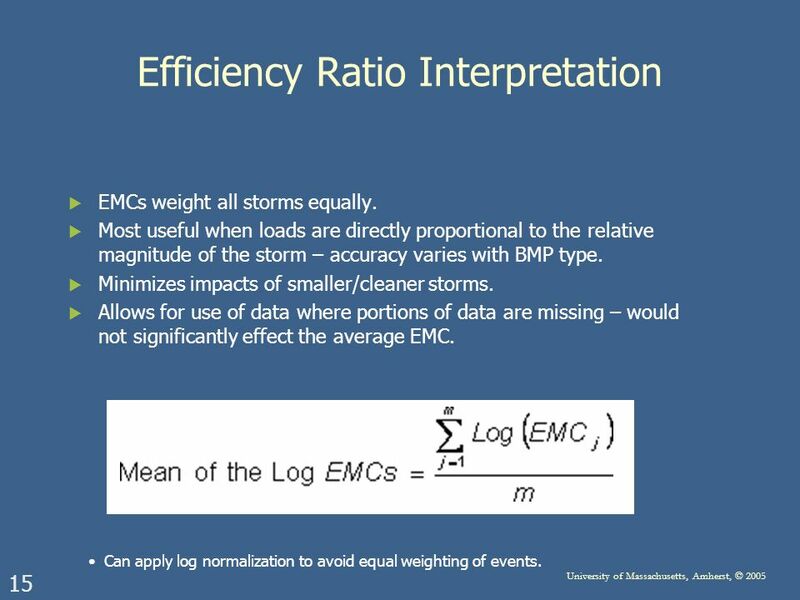 Allows for use of data where portions of data are missing – would not significantly effect the average EMC. 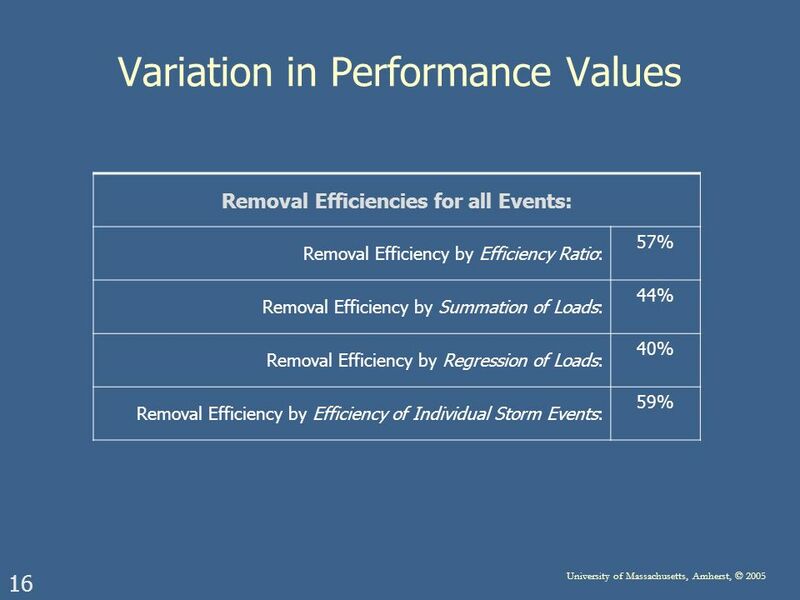 Can apply log normalization to avoid equal weighting of events. 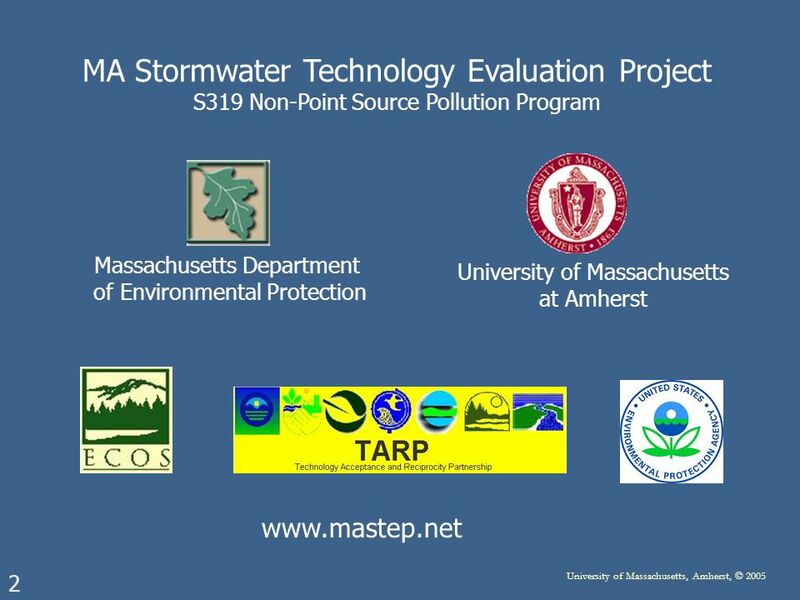 19 19 University of Massachusetts, Amherst, © 2005 Stormwater Database Project WWW.MASTEP.NET Project Goal: Provide technology transfer information about innovative stormwater Best Management Practices (BMPs) to MADEP, conservation commissions, local officials, and other BMP users to help them make appropriate technology implementation decisions. 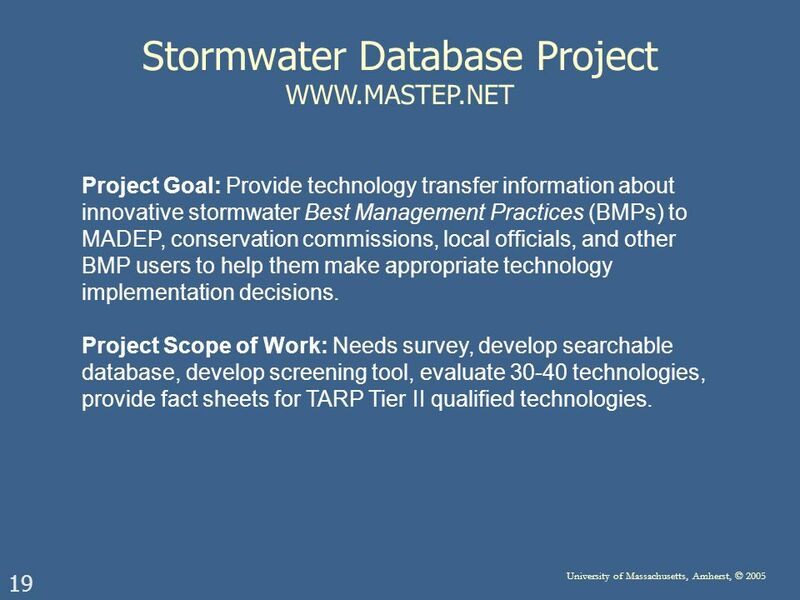 Project Scope of Work: Needs survey, develop searchable database, develop screening tool, evaluate 30-40 technologies, provide fact sheets for TARP Tier II qualified technologies. 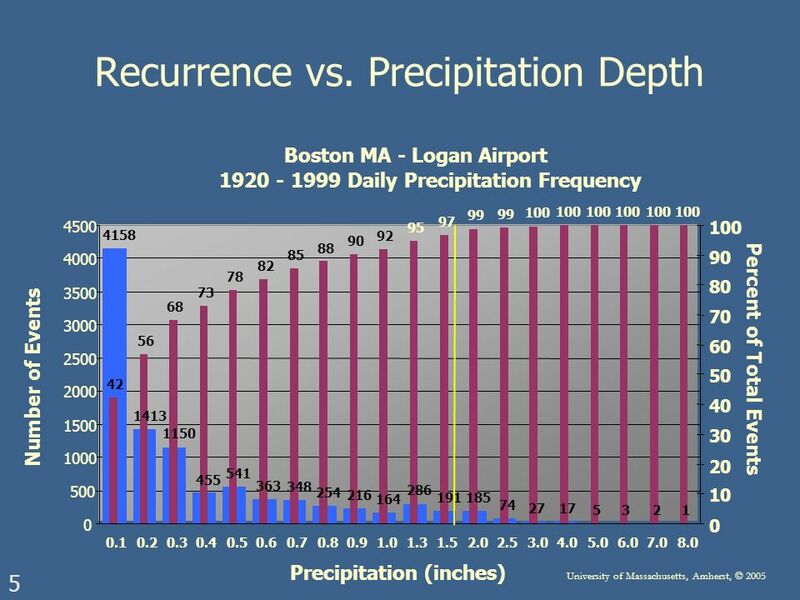 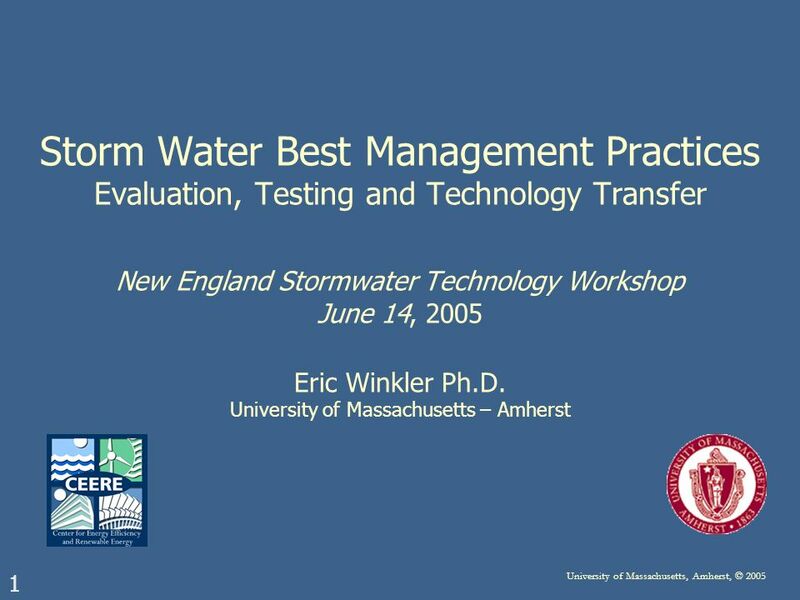 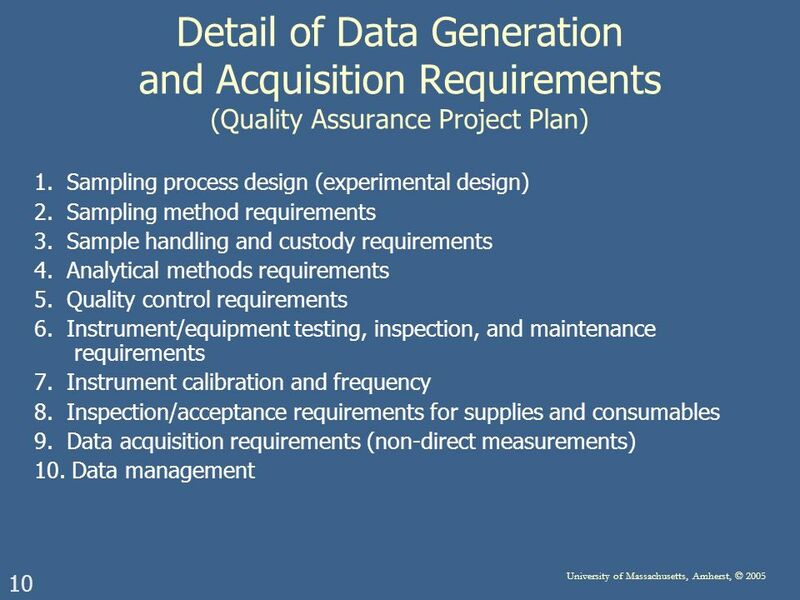 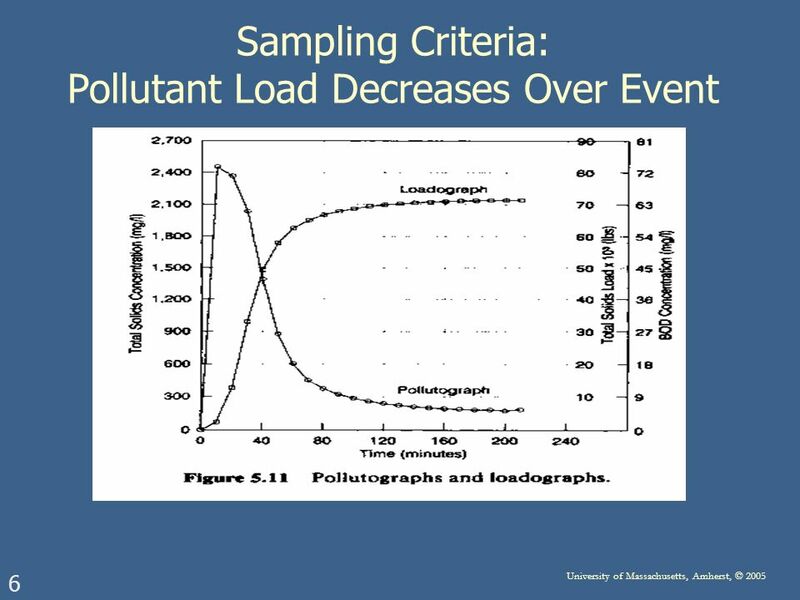 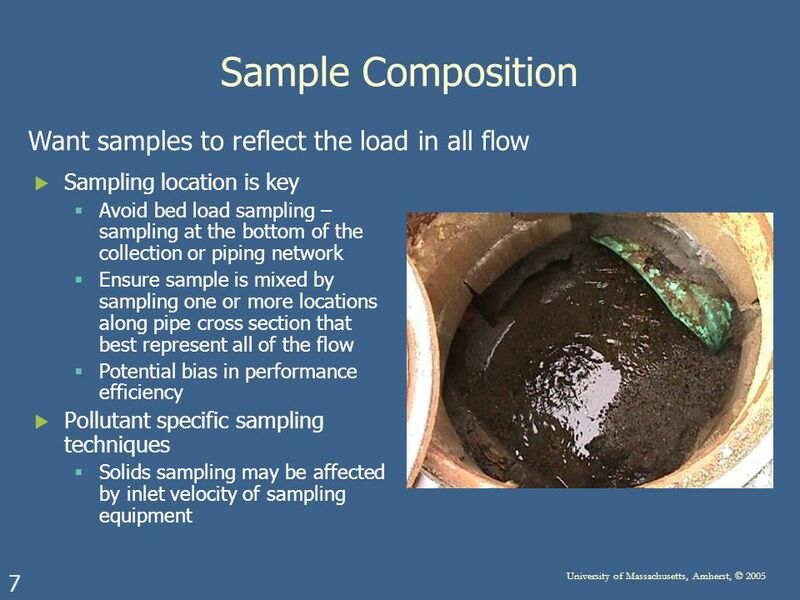 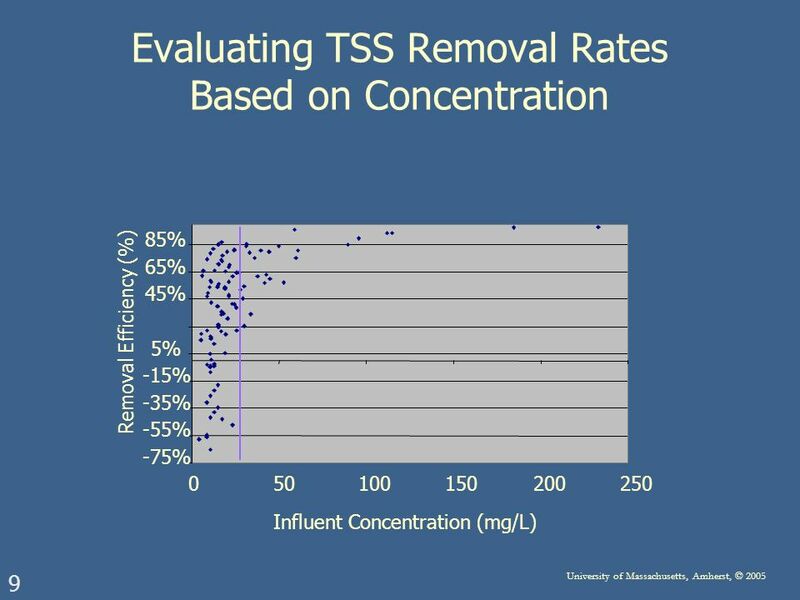 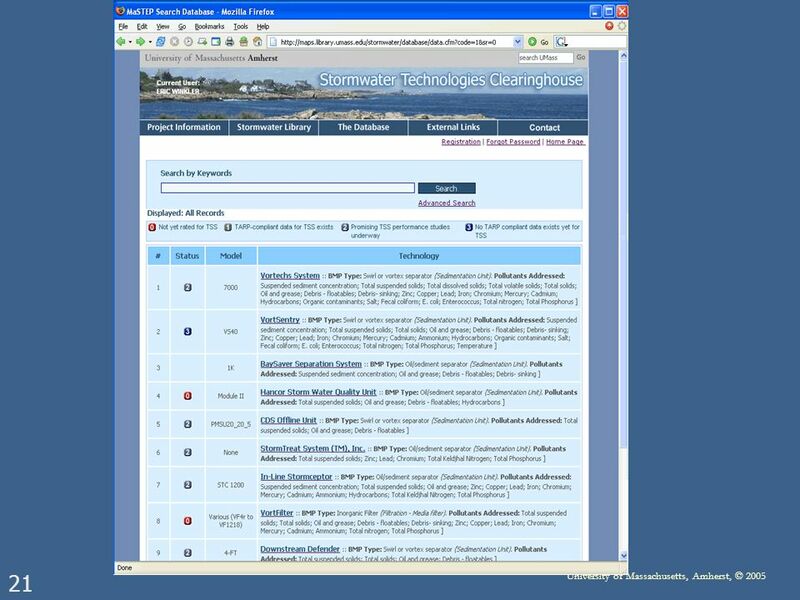 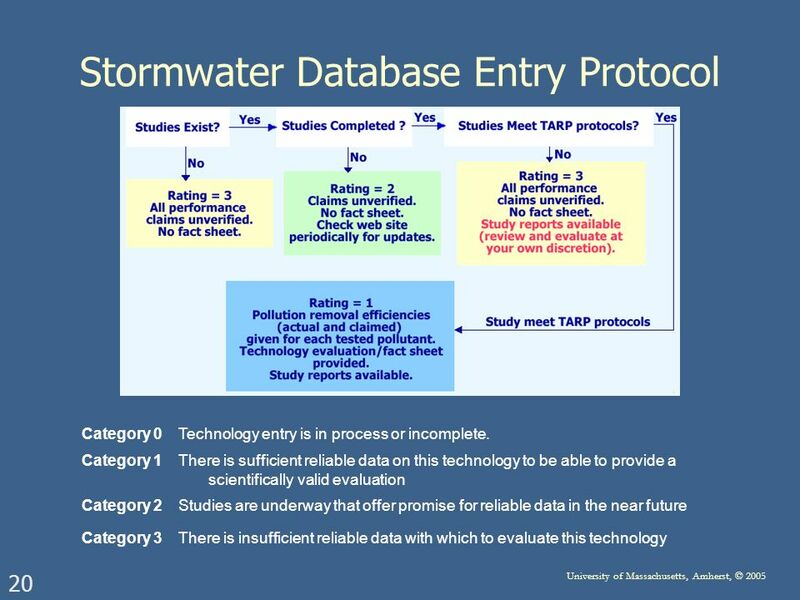 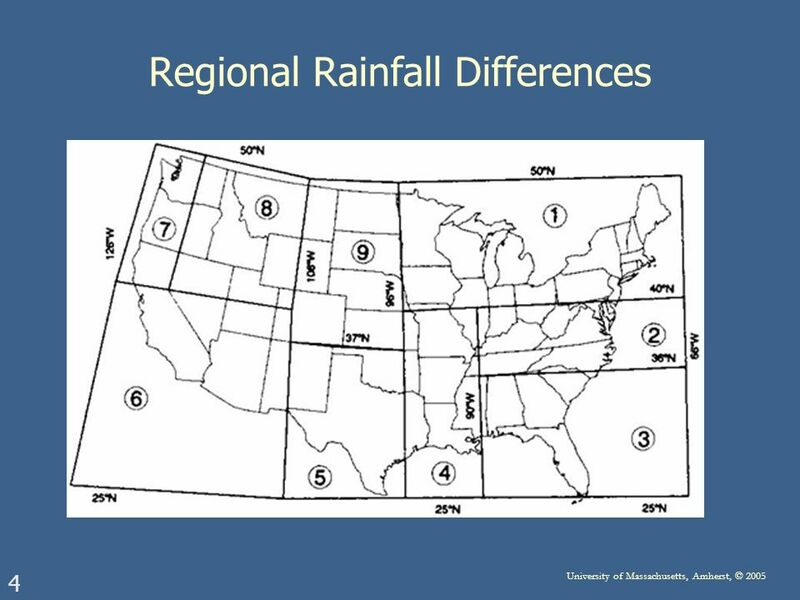 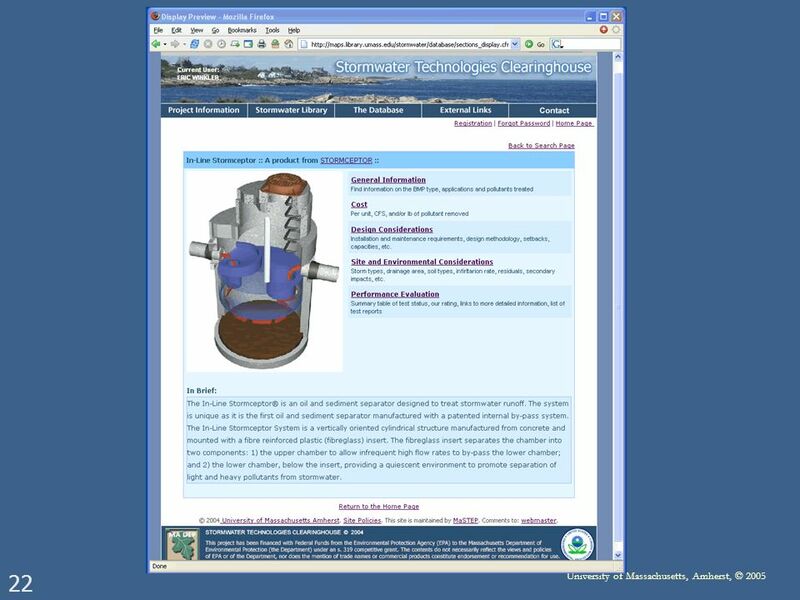 Download ppt "1 University of Massachusetts, Amherst, © 2005 Storm Water Best Management Practices Evaluation, Testing and Technology Transfer New England Stormwater." 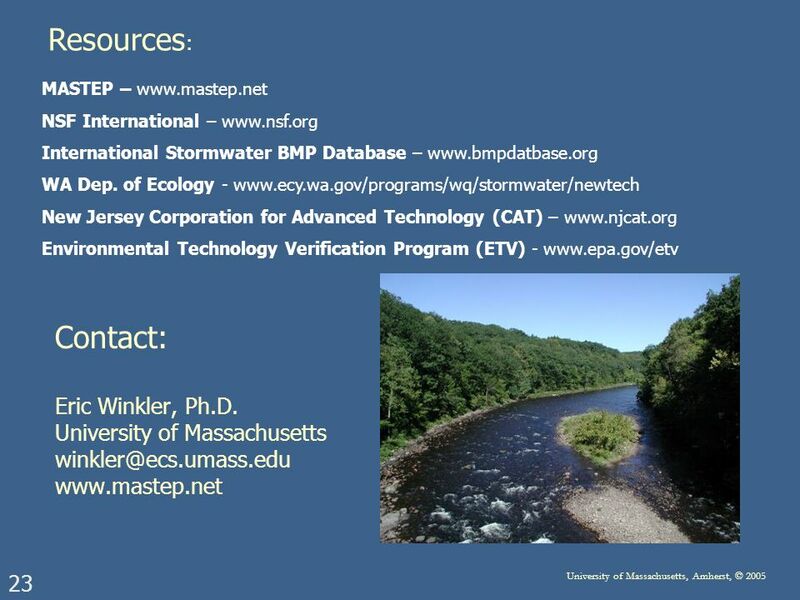 The University of Massachusetts Water Resources Research Center works with MassDEP under a contract funded by the Federal 319 grant program to evaluate.